Pizza has become one of the top-rated international foods in India. There are gourmet Italian restaurants in every town, regular pizzerias in every neighbourhood, and on top of that, we even see local bakeries and roadside vendors selling pizzas made of readymade pizza bases. Although pizzas are made with veg and non-veg toppings, we see a lot of vegetarian-friendly variants available everywhere. Almost everybody, from kids to elders, happen to enjoy their pizzas! The interesting part is that many of them do not even know that the pizza is an Italian dish, because it is so commonly available in India, and there are tongue-tickling Indian variants too, with tandoori paneer and kadhai- cooked veggies as toppings, seasoned with peppy masalas! The pizza is an Italian dish, made of a flat round disc of dough topped with pizza sauce, veggies, cheese and varied seasonings. It is a one-dish meal that can easily be made at home. If you have time, you can make it entirely at home, right from the dough to the sauce. However, for those who are short of time, there are workarounds like readymade pizza base and sauces. Although there is an endless variety of pizzas, and on top of that you can create your own by combining different toppings and seasonings, the following are some of the classic, evergreen pizzas commonly found in all professional pizzerias. You can make your dough and base at home or buy readymade pizza bases. While you might not have much choice when buying readymade bread, you can make one of these interesting bases if you are doing it all at home. How do you want to bake your pizza? Depending on the availability of appliances and tools, pizzas can be baked in one of the following ways. Each method gives the pizza a unique flavour and texture. There is no right or wrong combination of toppings as far as a pizza goes. Feel free to load your pizza with whatever is available and whatever you enjoy! A pizza is incomplete without cheese. Each type of cheese gives a different aroma, mouth-feel and taste to the pizza. You can go for one type of cheese or a combination. 1. The pizza sauce can make or break a pizza, so always give enough attention to making or procuring the best sauce. 2. Be generous with the cheese, but don’t overdo it. 3. Go for varieties of cheese that melt. 4. Bake your pizza till crisp. 5. Make sure you bake it just before serving to relish the best taste and texture. 6. Use only the right amount of toppings. Too much of it will make your pizza sagging and soggy! 7. Always top the pizza with a little Parmesan cheese after baking. Be it for your family or guests, pizza is a great dish to serve any time of the day. It makes a meal, but also doubles up as a snack, depending on the quantity one consumes. This versatile, please-all dish is a great choice for parties too. 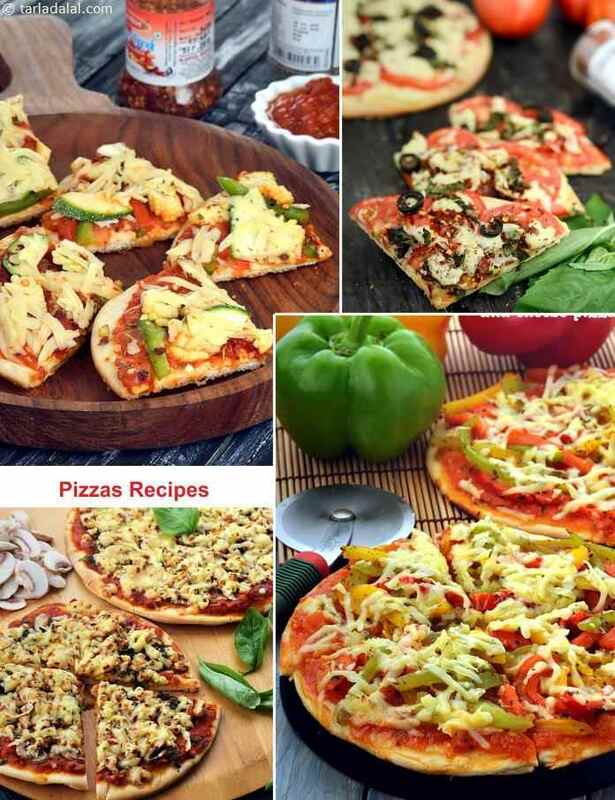 As you explore the world of pizzas, you will be fascinated by the existing variety and the many more interesting combos that you can create by unleashing your creativity! So, go ahead and enjoy baking your awesome pizzas. A scrumptious pizza with crunchy capsicum and juicy jalapenos, a spicy bean topping and loads of cheese. The pungent and aromatic mixture of kidney beans, tomatoes, onions, chillies and desi spice powders like cumin and coriander makes all the difference to the bean and capsicum pizza. Sumptuous and lip-smacking, nobody will have anything to complain about this pizza! A topping of herbed macaroni and garlic combined with a peppy red capsicum sauce makes this pizza really appetizing. Cooking and chopping the macaroni ensures that it blends uniformly with the other ingredients.